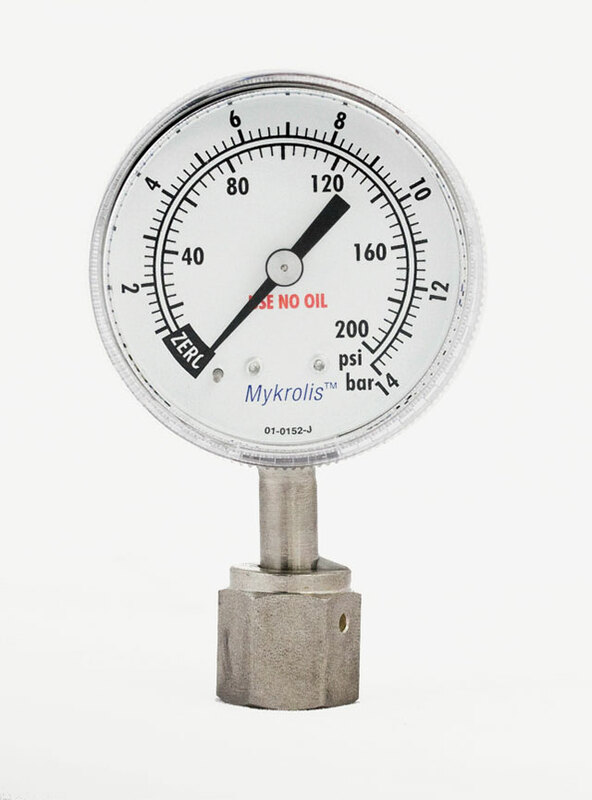 The selection of brass, stainless steel, and monel® gauges presented here represent those used on pressure regulators offered in this catalog. They can be used as repair parts or for installation in other systems. 1/4" NPT lower male connection. Cleaned for oxygen service - brass and stainless steel only. BRASS WITH BRASS CASE - 2 1/2" DIA. 316 STAINLESS STEEL WITH STAINLESS STEEL CASE - 2 1/2" DIA. MONEL® WITH STAINLESS STEEL CASE - 2 1/2" DIA. Other sizes and ranges available. On some high purity regulators the gauges are connected to the regulator body by using face seal fittings rather than NPT threads. 1/4" female face seal connection.